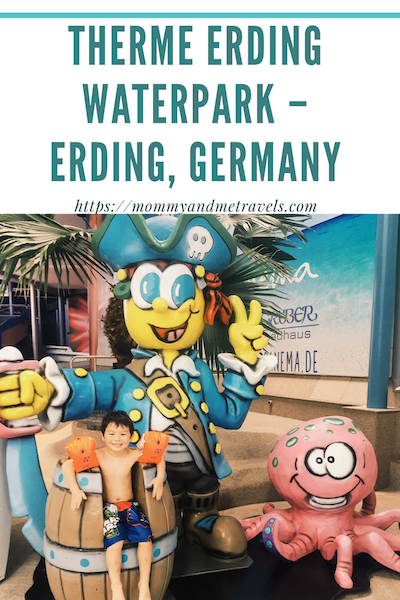 Therme Erding Spa and Waterpark near Munich, Germany is the best of both worlds for parents and children. 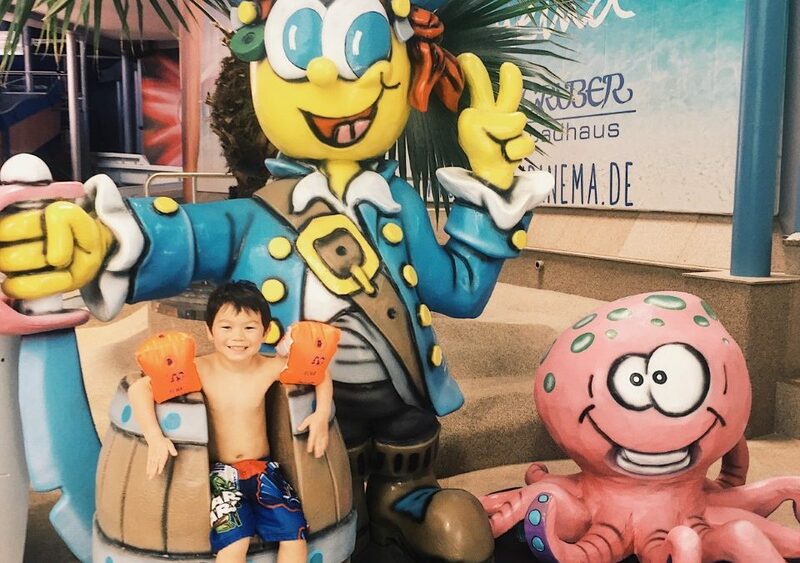 A waterpark for the kiddos and a spa area for adults all wrapped into one ticket price! Mommy And Me Travels was looking for a Schwimmbad (pool, in English) to let the kids escape the heat of summer when we found this gem just outside of Munich, Germany. If you ask my kids, they will tell you this was the best part of their Munich vacation. Ready for a day of waterpark fun! There are many different ticket options for this location. 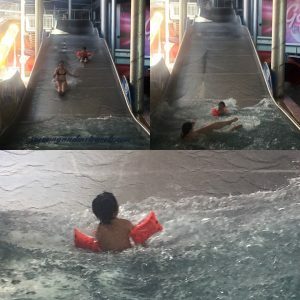 We chose to do the 4 hour Tropical Spa area, wave pool, Galaxy slides pass with the knowledge of each half hour after that being an extra charge up to the price of a full day pass (33 euro when we visited), children 3 and under are free. On your first visit you should probably plan for spending longer than you think you will. I’ll tell you that we ended up spending about 6 ½ hours at this waterpark. It was that much fun! Click Therme Erding website for most up-to-date pricing and times. So what was the most exciting thing about the park? My eldest son’s perspective is, of course, the water slides. He really enjoyed the pools and wave pool also. But he thought the water slides were the best in Germany (to date). There are two areas of water slides. One is outdoors and one is indoors under a retractable dome. We absolutely had to visit both locations many times for him to determine his favorite. With the votes in, his favorite area was at the indoor location. Why you might ask? Well, there are tube slides, tunnel slides, triple slides, family slides, and even virtual reality slides. Yes, you read that right, virtual reality water slides. Virtual reality will cost you 2 euro per ride, but it was worth it to us as we had never experienced anything like it. Exciting for young kids too! My youngest son was even able to partake in the family fun. 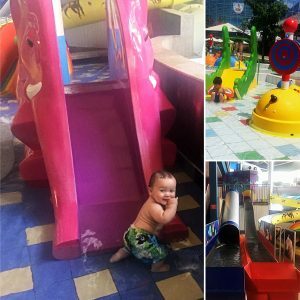 There are several splash areas for the youngest of kiddos, both indoors and out. These areas have little slides, waterfalls, and splash away zones. He was in hog heaven while my eldest rode the slides over and over again and played in the wave pool. This was the “bunny hill” of water slide areas… but still a ton of fun! So what about the activities for mommy (and even daddy’s)? Well this location also has a huge adult only (over 16) area that I was able to visit and relax for short times. The theme for this area is “health and beauty are of unparalleled importance”. During the day, I was able to come and go into the spa area as time allowed for breaks. This area of the park has saunas, steam baths, whirlpools, hot and cold thermal waters, bubble loungers, massage jets, lazy river, and a swim up bar. What more could a mommy ask for on a break? The park offers family activities and areas that we did not use/visit but I thought were worth a mention for your planning purposes. There is a Kids Club area that welcomes kids between the ages of 0 and 15 years old. We did not have a need to drop off our kiddos, but the kids that were there seemed to be having fun. It is a water park after all, who wouldn’t have fun. There is also Private Rest Areas that can be used for breaks, such as a nap. They looked to be in quiet areas of the park. The last thing I observed that we didn’t use (but really big plus for mommies) was the free diapers/swim diapers that were available in several of the restroom areas and private children changing areas. I had packed what we needed but it was nice to know that if we did run out that there are free options available. This is not supervised like we are used to at American water parks. There are few staff members monitoring the slides. At some slides there is a light system that tells individuals when to go but no lifeguard ensuring that everyone adheres to this system. We were not concerned about this but I did hear other families that complained about the lack of people telling them when to go or not to go. Accidents of running into others if you are not paying attention could happen. Explain the light system to your younger kids or, even better, accompany them on the slides to ensure that they are following the rules for everyone’s safety. This place is so large, I’m not sure that we even saw it all. That’s alright though, we will definitely be paying future visit to Therme Erding. 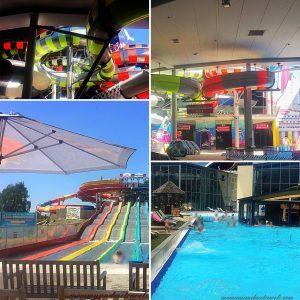 Looking for other ideas in the Munich area besides the Therme Erding Waterpark and Spa? 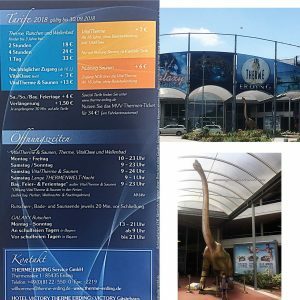 Check out our trip to Dinosaur Museum Altemuhltal and our Munich Kid Friendly 3 Day Itinerary. 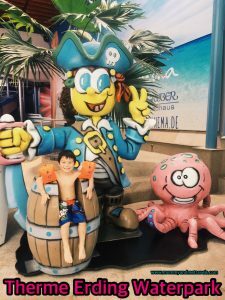 Do you know of any other water park gems? Share with us via comment, social mentions, or email below.